Gumbo is one of those dishes you will find that numerous people claim to have the perfect recipes. (and I am one of them 🙂 No matter what ingredients you put into a gumbo you’re going to get a little bit of the four cultures living in Louisiana: Cajun, Creole, Indian, and African. Louisiana’s Creole cooking came from a European blend of its French founders and the Spanish who took over the territory from France. The French contributed classic techniques like roux, and the Spanish introduced tomatoes, peppers and garlic that were commonly used in their cooking. Cajuns were French, Acadians exiled from Nova Scotia. They were simple country folks who cooked with what was cheap and available. 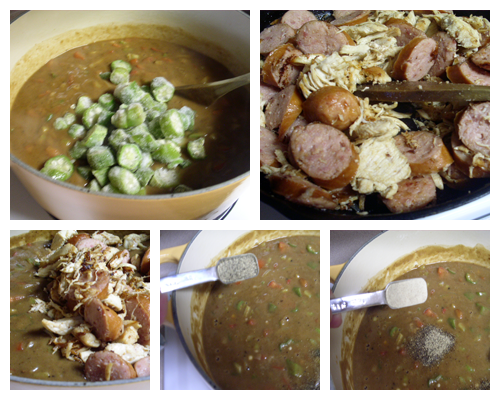 Slaves named the dish “gumbo” after the African word okra, used as it thickener. The native Choctaw Indians added file, their own thickener made from sassafras leaves. When you make your gumbo you need to know what differences there are in roux. There are three classic kinds of roux, named for their color -white, blond and brown. White Roux: is cooked for just a few min. long enough to get rid of the floury taste. It’s used for cream soups and bechamel sauces (cream sauces). Blond Roux: Cook the white roux a little longer, and it takes on a straw color. This blond roux has a hint of flavor and adds a warm color to veloute sauces (sauces made with chicken, fish or veal stock). Brown Roux: A brown roux has a nutty aroma and a rich, chocolate color that works well in dark soups and demi-glace (brown) sauces. Dark Brown Roux: Is a deeper mahogany, almost black, color roux that is used more for its nutty flavor than its thickening capabilities. White and blond roux use butter as fat. 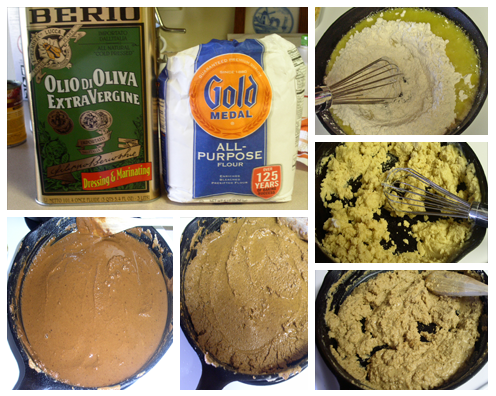 Use Olive oil in the darker roux because it produces a better color. I make the roux ahead of time. Roux can be made up to two weeks in advance and stored in the refrigerator. Make a bigger batch of roux helps control the quality with less chance of burning. The trick to making a dark roux is to brown it without burning it. That means you’ve got to keep stirring. To make chicken sausage gumbo I am using the dark brown roux. Turn the stove on medium high heat. Add to your cast iron skillet the oil then add the flour. Keep stirring stirring till the desired color, in this case I want it to be dark brown. This will take about 20 minutes. You can, and I suggest to make the roux ahead of time so it won’t take you that long to make the Gumbo. Now for this Gumbo I need 1/2 cup of the dark brown roux. so put the stove on medium high and add the following to the pot: 1/2 cup of dark brown roux, 1/2 cup of onion, diced, 1/2 cup of green pepper, diced, 1/2 cup of celery, diced. Cook for 5 minutes, then add the 2 cups Roma tomatoes, diced, 6 cups chicken broth (you can use the kind out of the box if you like). Add the 2 cups of sliced okra and the black and white pepper. Simmer for 20 minutes, the vegetables should be done. In the meantime saute in 1 tbsp of oil 1 cup of polish sausage sliced(the original gumbo is with Andouille sausage but I prefer the polish sausage), and 2 cups of shredded cooked chicken. Brown the meat on medium high for 5 minutes. Add this all to the pot with the roux and bring to a boil. Simmer for 5 minutes. Remove from heat and serve in a bowl with rice and a dash of the file powder. 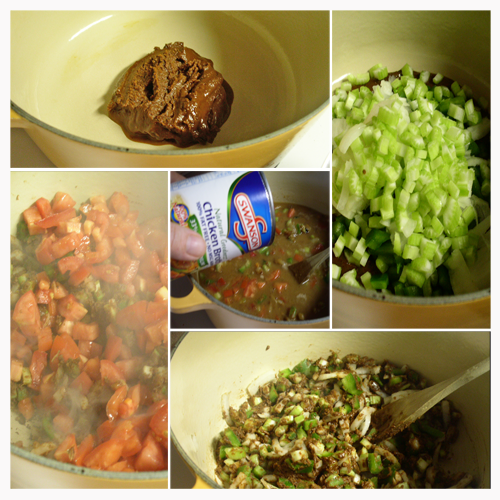 Gumbo is one of those dishes you will find that numerous people claim to have the perfect recipes. (and I am one of them 🙂 No matter what ingredients you put into a gumbo you're going to get a little bit of the four cultures living in Louisiana: Cajun, Creole, Indian, and African. Louisiana's Creole cooking came from a European blend of its French founders and the Spanish who took over the territory from France. The French contributed classic techniques like roux, and the Spanish introduced tomatoes, peppers and garlic that were commonly used in their cooking. Cajuns were French, Acadians exiled from Nova Scotia. They were simple country folks who cooked with what was cheap and available. 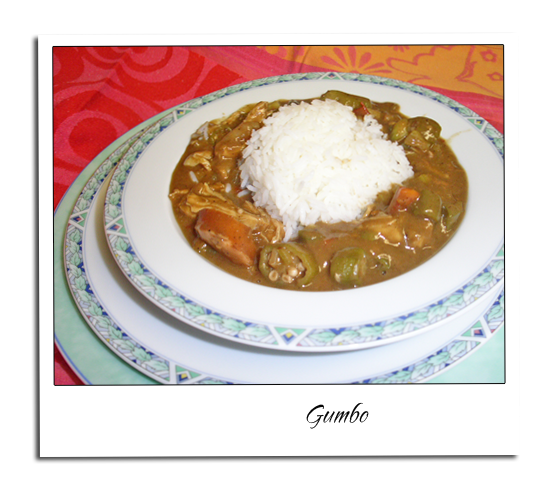 Slaves named the dish "gumbo" after the African word okra, used as it thickener. The native Choctaw Indians added file, their own thickener made from sassafras leaves. White Roux: is cooked for just a few min. long enough to get rid of the floury taste. It's used for cream soups and bechamel sauces (cream sauces). The trick to making a dark roux is to brown it without burning it. That means you've got to keep stirring. 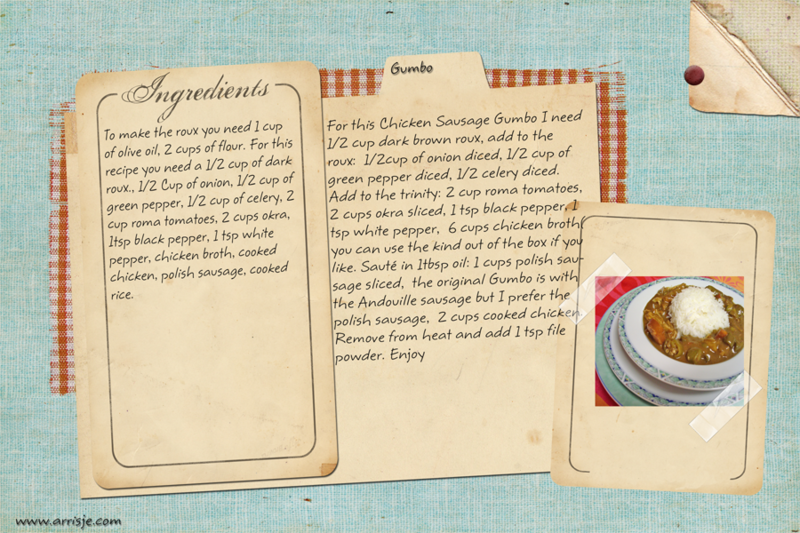 Now for this Gumbo I need ½ cup of the dark brown roux. so put the stove on medium high and add the following to the pot: ½ cup of dark brown roux, ½ cup of onion, diced, ½ cup of green pepper, diced, ½ cup of celery, diced. Cook for 5 minutes, then add the 2 cups Roma tomatoes, diced, 6 cups chicken broth (you can use the kind out of the box if you like).